Newcastle, a parish (formerly a parliamentary borough), in the barony of Newcastle, County of Dublin, and province of Leinster, 2 miles (N.W.) from Rathcoole: containing 1100 inhabitants, of which 397 are in the village. A charter, dated March 30th, 1613, was granted to this place by Jas. I. Whereby it was erected into a corporation, consisting of a portreeve, 12 free burgesses and a commonality, with power to appoint inferior officers: to hold a court of record for pleas to the amount of five marks, and be a guild mercatory and the portreeve to be clerk of the market. In 1608, a grant was made to Jas. Hamilton Esq., to hold a market here on Thursdays and fairs on the feasts of St. Swithin and All Saints, and the day after each; and in 1762 the portreeve and burgesses obtained a grant of a market on Mondays, and fairs on May 9th and Oct. 8th. All of these markets and fairs are now discontinued. The borough also sent two members to the Irish parliament, but it was disenfranchised at the Union (1800). There is a dispensary in the village, and a constabulary police station. Agriculture is in a high state of improvement; the principal crops are wheat, oats and potatoes. there are good quarries, the stone of which is used for building and repairing the roads. The Grand Canal passes through the parish. Part of the Demsne of Lyons, the splendid seat of the Rt. Hon. Lord Cloncurry, is in the parish: the other seats are Athgoe Park, the residence of Mrs. Skerrit, one part of which is an old castle, erected at a very early period, and in the grounds is the tower or keep of Colmanstown and an old burial place. Newcastle house, seat of Alex Graydon Esq., Newcastle, of the Very Rev. Archdeacon Langrishe; Peamount, of C.E. kennedy, Esq., Colganstown, of J. Andrews Esq., and Newcastle, of O’Moore Esq. The old church was erected about the 15th century, and is chiefly remarkable for its fine eastern window, which was removed to it in 1724, when the building underwent a thorough repar. In the R.E. divisions the parish forms part of the Union or district of Saggard: in the village is a neat chapel, with a belfry, erected in 1813 at a cost of about £1500. This has been Newcastle village green since the Normans came. The old house on this side of the thatched pub is probably on the site of the administrative building of the manor. Remember that this manor had no resident lord. It was owned by the King of England and so a stewart would have been in charge. Games were played here on the green. On a Sunday in 1308 a footballer from through the sheath of the dagger. Luckily the man was not seriously hurt. However, William had to pay the man for the injury he inflicted. The Green was sometimes called the Pound, a place where markets and fairs were held. In 1608 Newcastle had a licence to hold a weekly market and two fairs a year on this Green. The fairs were held on the feast of St. Swithin and the feast of “All Saints”. 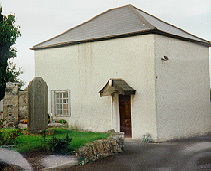 The church was built in 1813 just as the penal laws ended and it was a huge improvement on the thatched mass house on Athgoe Hill which had been in use since 1685. 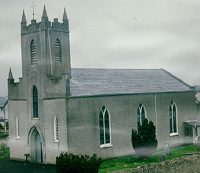 A lot of the 1,500 needed to build the church was given by Peter Warren Locke and local labour was supplied free of charge. The building of a church, a school and a priest?house helped the village to begin to grow again after it decayed in the 1700’s. The church is a barn church, typical of the period and is built exactly in the east – west direction. The Tower House was one of at least six fortified tower houses in Newcastle about 1640. These were the houses of the rich. The original doorway is facing away from the road. The tower house across the road has a murder hold – a hold just above the door which was used for dropping down rocks or boiling water on unwanted visitors. We know from these tower houses that Newcastle was a wealthy village in the middle ages but it was destroyed by the Earl of Ormonde in 1642 and it is probable that the tower houses were ruined at this time. Newcastle never really recovered from Ormonde’s revenge on the people for supporting rebelling Catholic troops in the village in 1641. The Church was built around 1400 on the site of older churches dating back to early Christian settlement here The tower of the church may be even a little older. This was where the priest lived. Can you imagine the dangerous times they must have been in if even the priest’s house was built like a castle. The ‘East Window’ is one of the best examples of it’s kind to be seen in Ireland. This window was originally in the chancel. It was moved into the nave of the church in the 1600’s when it was a Protestant Church. The small Protestant population did not need a big church so they blocked the original church between the nave and the chancel. The east window was too beautiful to leave behind in the abandoned chancel and so it was moved into the nave. The tracery or ornamental stonework are said to be curvilinear-five shaped curves creating a sense of movement within the design. At the back there is a garden leading down to a small lake. Beside the lake is the oldest Yew tree in Ireland. Another tree in the grounds is called the Deans tree. It is said that the famous Protestant Dean of St. Patrick’s Cathedral Jonathan Swift used to visit this house and sit here. 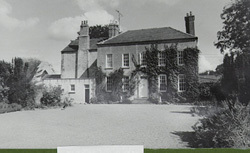 It is not surprising that this famous writer of books like Gullivers Travels should be visiting here as this house was the property of the Church of Ireland and the local rector lived here.The word “Glebe” means land attached to the Church and so many “Glebe Houses” were originally homes of Protestant rectors and like this one here are now privately owned. On 18th April, 1825 this school opened and it became a recognised school ten years later with 90 boys and 89 girls attending. Among those who signed the application to make Newcastle an official school were Lord Cloncurry and John Locke Sherritt. The pupils paid a halfpenny – a penny per week. Older children had a reading, spelling and arithmetic book as well as book-keeping and measuring books. School was open from 10.00 a.m. – 4.00 p.m. six days a week but all day Friday only religion was taught. There were seats for 8-10 pupils with an inkwell in front of each pupil. Boys were taught on the ground floor and girls were taught upstairs. When the old School was built in the 1930 the first school continued to be used as a classroom whenever extra space was needed. It was last used in the 1970 before the new school was built. 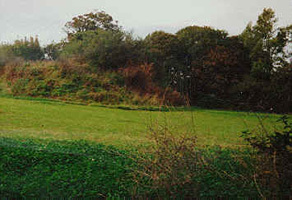 The Motte is the first thing that the Normans would have built when they arrived here about 1170. At that time it probably had a wooden castle on top. Over the years this would have rotted away. Newcastle Lyons means the new castle of Liamhain. This motte was surrounded by a bailey. The bailey was built by digging a trench all around the motte, piling up the earth and putting timber stakes on top of the earth. People could run here for protection for themselves and their cattle and horses if the Irish attacked them. The native chief of Liamhain at the time the Normans built the Motte was McGiolla Mocholmog. He later made a deal with the Normans and was allowed to rule this area again. However, in 1215 his nephew and heir lost all this land when the King of England took it for himself and Newcastle became a Royal Manor. 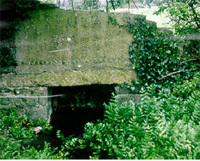 For more than 1,000 years this well has always been regarded as a Holy well by the people who have lived in Newcastle. St. Finian’s main monastery was at Clonard on the banks of the Boyne about twenty miles away. The monks there were famous not only for their holiness but also for their learning. St Finian is known as the “teacher of the saints of Ireland”. Can you imagine all the people who would have visited this well looking for a cure for their ailments. The people of Newcastle always respected and learned the customs and traditions of their parents and grandparents and so respect for St. Finian has lived on here. Our school and our G.A.A. club still keep his name alive and so the tradition lives on. St. Patrick began to convert the Celts to Christianity in 432 A.D. and soon many monasteries were set up throughout the country. 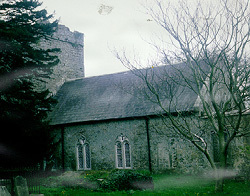 St. Finian founded a famous monastery at Clonard in the Kingdom of Leighlin. This granite cross is a sign that a small monastery was set up here. Often these ancient Christian monasteries were built on important pagan sites. This would explain why the cross and the pillar stone are beside each other. The cross is made of granite, a very weather resistant stone. It would have to be as it is here for about 1,500 years. There is a cross-in-circle on the front of the cross. Imagine what this place looked like when the monks put up this little cross all those years ago. Maybe there was a little church where the church now stands and a few little huts for the monks to live in. Pillar stones like this one here were used by the people who lived in Ireland 2,000 years before Our Lord was born. The Bronze Age people made tools and ornaments out of bronze and gold. Some of them may have used this Pillar Stone to mark a burial ground or a place where they held a ritual – maybe adore a sun god and earth goddess.